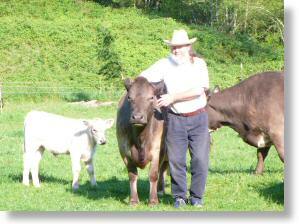 We selected to raise Murray Grey beef cattle; because they excel at producing choice grade meat on pasture grass feed. The breed was developed in Australia and came to the United States in the 1970s. The breed was formed by crossing the Shorthorn and Angus breeds. These are a calm and gentle breed that responds well to the low stress handling practices at our farm. 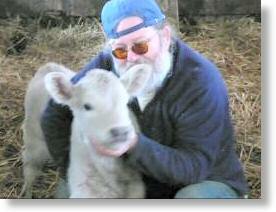 We make an effort to spend time with the cows and calves throughout the year. Trust reduces adrenalin for us all. This is great at calving time; if they need help there is no panic while we are working with them. The mothers are generally friendly and let us touch their newborn calves, (usually their most protectively aggressive time of life). DNA testing has become available to the livestock industry in the last few years, so we can evaluate traits like marbling and tenderness. We have gathered this information by testing our handsome bull Ulysses who carries 6 of the 6 possible predictors for tenderness. Lucky us! Our sheep ewes are the Targhee breed which Sage started raising so many years ago in Montana. It is a breed developed in Idaho to be great mothers of twin lambs, and produce soft wool suitable for hand spinning and knitting or weaving clothing. Since we are now focusing on selling lamb, we have selected to add the Texel breed of sheep to the flock. Texel sheep originated on the Frisian Islands off the coast of The Netherlands. There is an Isle of Texel, nothing to do with Texas at all. This hardy coastal breed produces fast growing meaty lambs ideal for our farm, and of course the wool seems a good mix too. Now the lambs seem even cuter and the mothers are as gentle and devoted as the Targhee. Copyright © Meadow Harvest - All rights reserved.